Tag line: "Without an enemy there can be no war"
Inspired by an actual event that occurred during World War I, Joyeux Noel recounts a 1914 Christmas Eve cease-fire, when troops from both sides met each other in No Man’s Land and exchanged pleasantries, forgetting, for a few moments, that the person they were talking to was the enemy. Written and directed by Christian Carion, Joyeux Noel follows three separate divisions: the Royal Fusiliers from Scotland, under the command of Lt. Gordon (Alex Ferns); France’s 26th Infantry, commanded by Lt. Audebert (Guillaume Canet); and the troops from Germany’s 93rd Infantry, commanded by Lt. Horstmeyer (Daniel Brühl). The few skirmishes that have broken out between them have thus far been costly; during the most recent battle, A young Scot boy named Jonathan (Steven Robertson) lost his older brother William (Robin Laing), who was killed by enemy fire. The French and Germans also suffered heavy casualties during the melee; dozens of French soldiers were killed moments after leaving their trench, and those who made it to the German side inflicted heavy damage on the enemy. Among the German troops is a private named Nikolaus Sprink (Benno Fürmann), a famous tenor before the war who, along with his fiancée, fellow singer Anna Sorensen (Diane Kruger), toured Europe, usually performing in front of packed houses. In fact, the two are so well-respected that Anna has arranged for Nikolaus to receive a one-day furlough from the trenches on Christmas Eve, during which the lovers (after a brief reunion) will sing for the army’s higher echelon, which has gathered, along with the Crown Prince, at a large villa in occupied France. Soon after arriving there, however, Nikolaus, disgusted that the generals live in comfort while his fellow soldiers are dying in the trenches, announces that he must return to his unit so that he can perform for them instead. Joined by Anna (who refuses to leave his side), Nikolaus does exactly that, and as he sings “Silent Night” for his comrades, he’s accompanied by bagpipes from the Scottish trench, played by Father Palmer (Gary Lewis), a priest currently serving as a stretcher-bearer. Inspired, Nikolaus grabs a Christmas tree (gifts from high command) and walks into No Man's Land, singing “Adeste Fideles”. He’s soon joined by Father Palmer, and before long, the troops from the three armies have gathered together, sharing champagne and showing each other pictures of their loved ones. The early scenes of Joyeux Noel, set before the cease-fire, reveal, in grisly detail, the horrors of trench warfare; the battle between the French and Germans quickly becomes a slaughter, with both sides losing a fair number of troops. We also experience, at this point in the movie, the hatred all of the men (Scottish, French, and German alike) feel for their supposed “enemy”, who they believe is both treacherous and bloodthirsty. All of these feelings dissipate on Christmas Eve, when the three armies realize they have more in common with each other than they do their own leaders, who know nothing of the terrible conditions they’re subjected to day in and day out. Though on opposite sides, they are brothers-in-arms, which makes continuing the war (once Christmas is over) damn near impossible. Naturally, their leaders are none too pleased when they hear of the cease-fire festivities, but the men don’t really care. Their eyes have been opened, and it’s going to take more than rhetoric and propaganda to close them again. 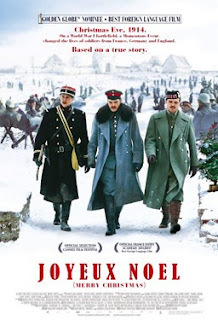 Delivering its message as effectively as Paths of Glory and All Quiet on the Western Front, Joyeux Noel shows us, in just under two hours, both the brutality and the futility of war, in a way that is likely to move even the sturdiest members of its audience to tears.